Members: Daishi (vocals), Lida (guitar), Aya (guitar), Seek (bass), Yura sama (drums). 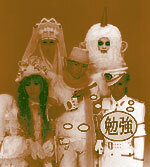 Psycho le Cemu is considered a visual kei group, but they're a avery unique one. Their style of music is sometimes typical visual kei style heavy metal, and sometimes pop. Sometimes it's even a combination of both. In June 2005, Daishi was arrested for posession and use of speed. As a result of this, Psycho le Cemu was officially disbanded. Former vocalist Daishi then went on to a band called "the Romeo". Aya and Seek also started a band called "Mixx Speakers Inc."
Bloodtypes: Daishi - B, Lida - A, Aya - O, Seek - AB, Yura sama - AB.